A 7 frame spacer tool is used for a 8 frame hive. 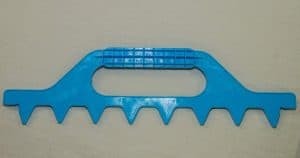 The 7 frame spacer tool will evenly space the frames properly the honey bees will comb out the frames further so it is easier to de-cap the frames of honey. Additionally, when the frames are spaced properly, with this spacer, the honey bees will not create burr comb. 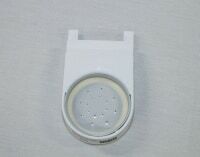 The spacer is made of plastic and cleans very easily.